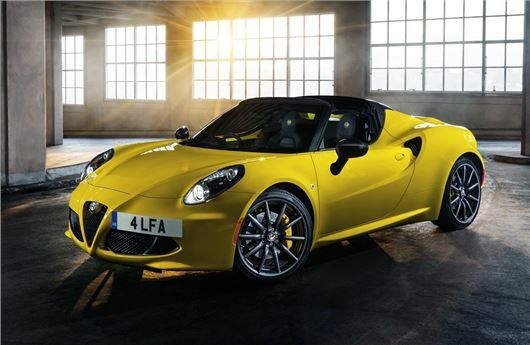 The Alfa Romeo 4C Spider is now available to order, priced from £59,500. That's a hefty £15k more than the coupe version, which has had something of a lukewarm reception from critics. To justify that extra cost, the open top version of the 4C gets a new aluminium rollover structure which sits below a carbon-fibre windscreen frame and a high-strength steel engine compartment cross-member. It also has a different rear end complete with a new engine cover with a subtle rear spoiler. At the front it gets the projector-style xenon headlights - that are an optional on the coupe - as standard. The standard fabric roof has to be removed and stowed away but there is a carbon fibre roof available as an accessory. Options include a carbon-fibre air intake system, designed to provide extra transmission cooling olus there are new alloy wheel designs. A bright yellow Giallo Prototipo paint colour is also available. The standard specification includes an Alpine head unit, luxury floor mats, glove compartment with leather cover, a bespoke car cover and car care kit plus parking sensors and cruise control.